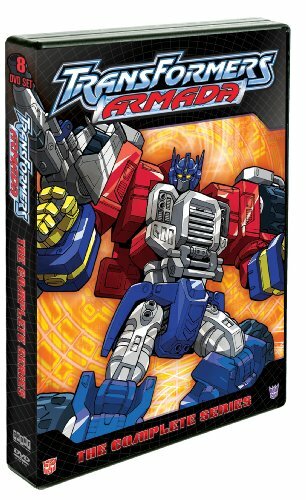 Brace yourself to relive some of the most astonishing TRANSFORMERS battles between the AUTOBOTS and the DECEPTICONS through the complete series release of TRANSFORMERS ARMADA. In 2002, TRANSFORMERS fans and kids were introduced to the animated television series TRANSFORMERS ARMADA. This is the unforgettable chapter of TRANSFORMERS lore and the first part of the rare UNICRON Trilogy - consisting of ARMADA, ENERGON and CYBERTRON. OPTIMUS PRIME, his team of AUTOBOTS and their human friends stepped up the fight against MEGATRON and his DECEPTICONS for control of the universe and the power-enhancing MINI-CONS, a lost race of TRANSFORMERS. Valor, deception and unexpected twists unfolded in these captivating adventures, leading to an unlikely alliance between natural enemies in the face of a genuine evil known as UNICRON. On March 11, 2014, Shout! Factory, in collaboration with Hasbro Studios, will unleash Transformers Armada: The Complete Series on home entertainment shelves everywhere. For the first time ever, the entire series is collected in one deluxe 8-DVD set, featuring all 52 memorable episodes. Whether reliving the childhood memory or discovering this series for the first time, this is an essential home collection for every fan, collectors and entire family to complete their TRANSFORMERS home entertainment library. This complete series 8-DVD set is priced to own at $44.99 SRP. Our heroes, the AUTOBOTS and their nemesis, the DECEPTICONS are at it again in this complete series of the TRANSFORMERS ARMADA. This series open to a war between the two factions of TRANSFORMERS on their home planet of Cybertron over MINI-CONS, a race of smaller, power-enhancing TRANSFORMERS. This struggle will bring AUTOBOTS, DECEPTICONS and MINI-CONS to earth, where they continue to battle, even after two humans get involved. Through the course of this series, the TRANSFORMERS face mysterious mercenaries, mighty MINI-CON weapons and even time travel as they fight for control or freedom.